SPEAKERS at the North Channel Chamber luncheon last week were Greg Ollis, Channelview ISD superintendent; King Davis, Sheldon ISD superintendent; Angi Williams, Galena Park ISD superintendent; Charles Grant, former president of the Chamber, and Shalonda Dawkins, 1st vice chair of the Chamber. 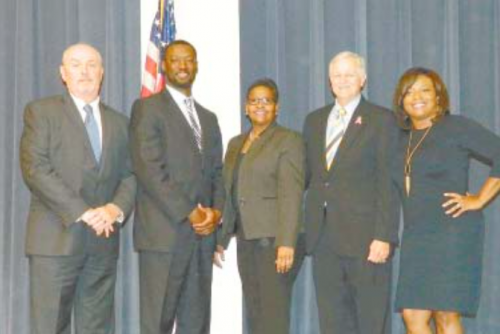 Superintendents of the three school district in the North Channel area were the featured speakers last Friday at the Chamber’s monthly luncheon. Emcee for the luncheon, held at the San Jacinto College student union, was former Chamber chairman Charles Grant. He is now heading up a membership drive for the chamber, entitled Forty for Forty in Four. This is a reference to the 40th anniversary of the chamber, and the goal of adding 40 new members in four weeks. With a sly sense of humor, Grant has offered to “Kiss A Pig” if the chamber board and members meet this goal. AUCTIONEER for the event was Patrick Kelly, well known radio personality, at right. Also helping were Jerry Fallin and Rojean Norris. In this photo, two of the auction items appear: a stainless gas BBQ cooker at left, and a handmade quilt at right. 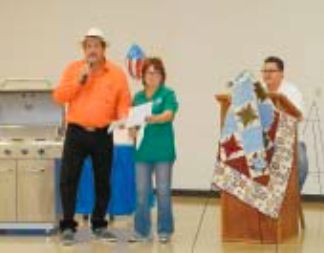 NORTH CHANNEL – Several hundred people gathered at the Baldree Center on Corpus Christi last Saturday, for a delicious spaghetti dinner, tasty desserts, a silent auction, a live auction, and a raffle. The ladies of the San Jacinto Pilot Club were holding their 29th annual Spaghetti Dinner and it was quite successful. According to club member and Director Julie Fallin, the dinner tickets amounted to about 400 with an additional 175 for the C. E. King band, and the raffle tickets sold amounted to about 500. On Saturday, October 1, the Jacinto City Elementary student council participated in the Susan G. Komen Race for the Cure at the Sam Houston Park in downtown Houston. These fourth and fifth grade council members participated to show appreciation and dedication to the Houston area community. Many of the students expressed interest in doing something that made a positive impact on their lives while showing support for cancer survivors, those who are currently battling cancer, as well as to honor individuals who have lost their lives to breast cancer. 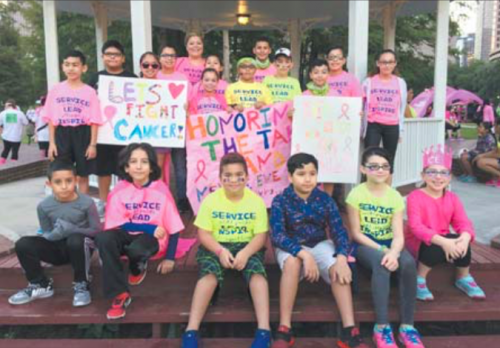 “Participating in the Race for the Cure made me feel proud because some people have cancer, and I walked to help them get better,” Jordan Balderas, 5th grader said. To donate to Susan G. Komen, visit http://www.komen-houston.org/make-a-donation/ or text @race to 52104. 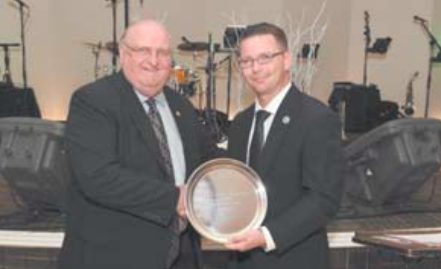 Judge Mike Parrott receives “Service to Our Community” Award from Commissioner Jack Morman during the recent annual Black & White Ball. The Honorable Judge Mike Parrott was honored with the Jim Fonteno “Service to Our Community” Award during Harris County Precinct Two’s Annual Black & White Ball on September 9, 2016 at Sylvan Beach Pavilion in La Porte. Commissioner Jack Morman paid special tribute to Judge Parrott for his long-standing support of Precinct Two’s nonprofit senior, youth and veterans programs.